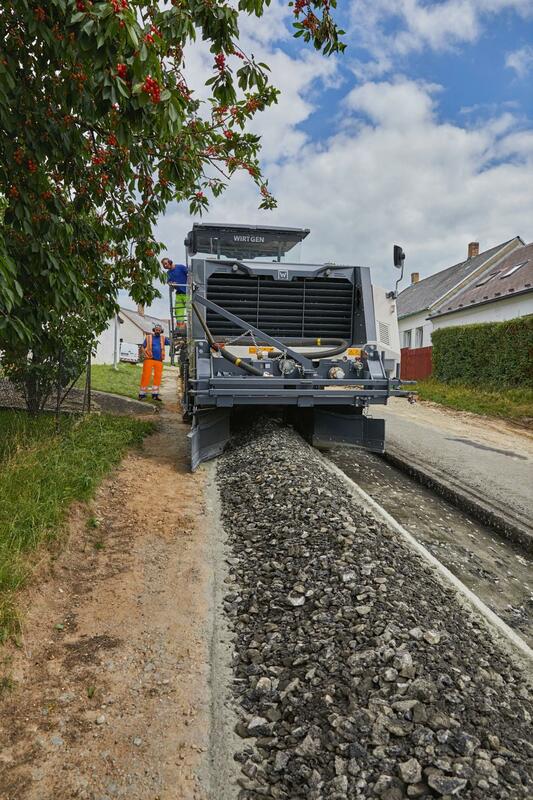 With all of the machines required for the process in its portfolio, the Wirtgen Group offers product solutions that cover the entire in-place cold recycling value chain. The star of the show: the W 380 CRi cold recycler from Wirtgen. Due to the rapid increase in heavy-duty transport, the global road network is showing visible signs of aging in many places. In order to ensure that the road infrastructure remains functional over the long term, roads are increasingly requiring structural rehabilitation. Wirtgen developed the high-performance W 380 CRi cold recycler specifically to meet these requirements. Road rehabilitation projects all have to meet the same requirements, regardless of where they are being carried out: they must be cost-effective,eco-friendly, and above all, finished quickly —because time is of the essence. Patchwork repairs are neither sustainable nor do they address the root cause. The cold recycling process —which at a minimum recycles the surface and base course material —is already popular today, and demand for this solution will continue to grow in the future. In the in-place cold recycling process, for example, the asphalt surface is removed either in full or in layers, depending on the level of damage, by a recycling train operating across the entire width of the pavement in a single pass, mixed with binding agents on site, and then paved again immediately. At the heart of this recycling train are tracked cold recyclers such as the new W 380 CRi from Wirtgen. With available working widths of 10.5, 11.5 and 12.6 ft. (3.2, 3.5 and 3.8 m, the recycler mills the road between 3.9 and 11.8 in. (10 and 30 cm)deep in most applications. At the same time, it granulates the material and transforms it into a new, homogeneous material mixture by adding binding agents such as cement, bitumen emulsion or foamed bitumen. With a mixing capacity of up to 882 ton (800 t) per hour, the cold recycler can feed enormous quantities of recycled material to a Vögele paver via its swivel-mounted and height-adjustable discharge conveyor at the rear. This makes it possible to complete extremely long stretches of road in a single day of work. Final compaction is carried out by Hamm tandem and tyre rollers. 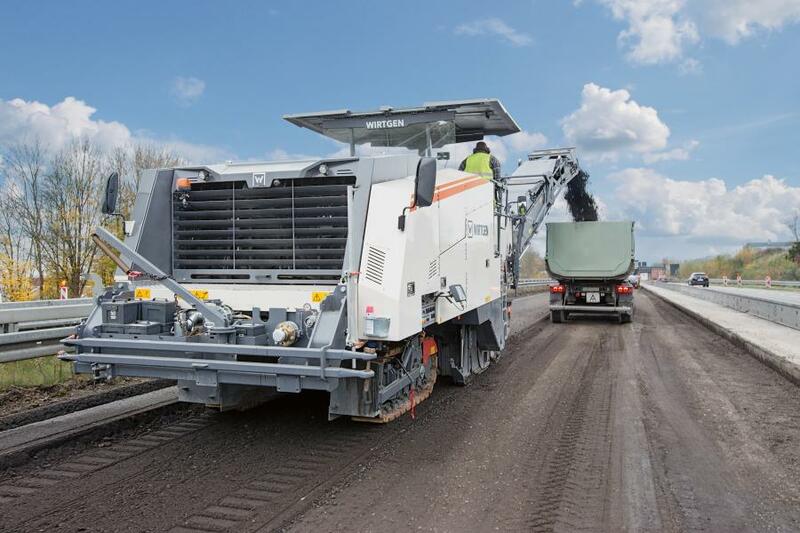 Wirtgen’s tracked recyclers use the down-cut process when recycling. The cold recycling pioneer developed this process, in which the milling and mixing rotor rotates in sync, years ago. 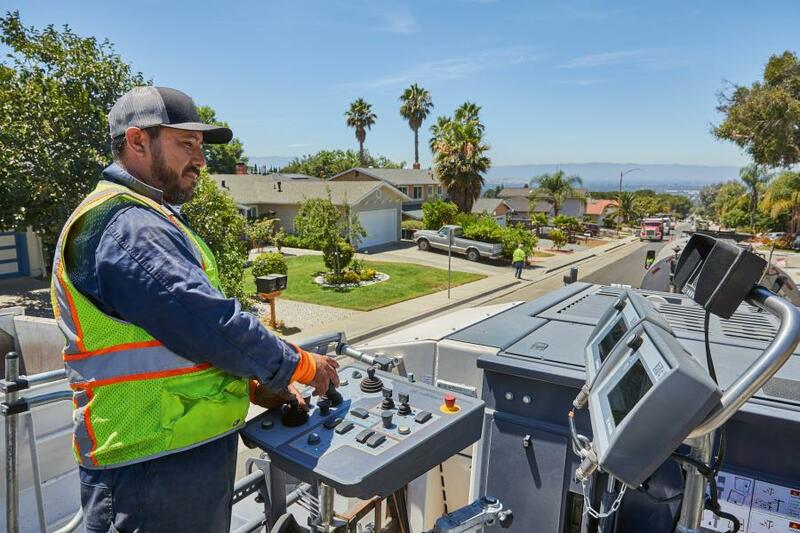 This method has become an essential part of day-to-day recycling operations, as it makes it possible to selectively vary the particle size of the material being processed —especially in the case of fragile, thin, old asphalt roads. Roads rehabilitated using the cold recycling process also have to meet the same durability requirements as roads designed and built using conventional methods. With the development of its own laboratory equipment, Wirtgen has created solutions which guarantee that the rehabilitation measures will be cost-effective and sustainable even before they are carried out. As a result, the recycler not only makes it possible to define the ideal composition of the RAP, but also to directly analyze its quality and properties using samples in triaxial and splitting tensile strength tests. The quality of the foamed bitumenalso can be precisely defined in the materials laboratory before starting the rehabilitation project. Cold recycling, particularly with foamed bitumen, is becoming increasingly popular with road authorities and construction companies. In this process, the foamed bitumen isprocessedin-place with the existing building material.The newly produced bituminous mix is known as BSM (bitumen-stabilized material).After final compaction, it shows a long-term and extremely high load-bearing capacity. Viewed from a long-term perspective, BSM has another advantage: the foamed bitumen mixed in leads to selective adhesion within the cold recycling layer and thus prevents cracking. The permanent layers prepared in this way form the perfect foundation for the final asphalt layer with considerably reduced thickness, according to the manufacturer. Another advantage of the cold recycling process that cannot be understated is the significant potential for energy savings during material processing. The raw materials do not have to be dried or heated, which means that 10-12 liters of fuel can be saved per ton compared to conventional rehabilitation methods. By almost completely reusing the surface course, the need to transport building materials can be reduced by up to 90 percent. At the same time, companies can cut resource consumption by 90 percent and completely eliminate the need to dispose of materials. This results in significantly reduced fuel consumption and lower CO2emissions. Most importantly, the cold recycling design makes it possible to reduce the use of binders by up to 50 percent — the area with the greatest potential savings, since binders are still the biggest cost factor in road rehabilitation. Due to the special properties of BSM, cold recycling technology results in very low costs over the entire life of the roads. In addition to the W 380 CRi (775 kW; EU Stage 5 / U.S. Tier IVf) and W 380 CR (708 kW; EU not regulated / U.S. Tier II) models, the new generation of Wirtgen recyclers also includes the W 240 CRi (775 KW; EU Stage 5 / U.S. Tier IVf) and W 240 CR (708 KW; EU not regulated / U.S. Tier II). The W 240 CRi and W 240 CR recyclers also can be equipped with integrated Vögele AB 375 T variable screeds and have a maximum working width of 7.7 ft. (2.35 m). The four cold recyclers also can be used as efficient, high-performance milling machines employing the traditional up-cut process. Due to powerful engines and an impressive conveyor belt capacity, they achieve high removal rates at a maximum milling depth of up to 13.7 in. (35 cm) — for instance when removing complete asphalt packages or for large-scale rehabilitation measures such as on motorways or airport runways. Next articleSignUp for Food Scrap Recycling and Receive a Free Cookie at Cooked & Co.